Originally intended to see both a 7'' and CD release, The Butler Stands For Us All remained a wax item only, limited to 500 copies. A single for Pollard's '08 solo LP Robert Pollard Is Off To Business, the single never saw a proper CD release and remain a difficult artifact to track down. Especially disappointing, the fact that the b-side contains 4 (!) exclusive tracks, still unavailable for download. Happy hunting. 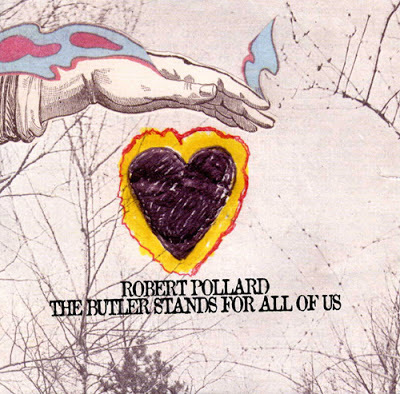 The Butler Stands For Us All- The same track as reviewed on Robert Pollard Is Off To Business. Check review there. First Wave- 1 Pollard plays a sickly sounding, brittle acoustic guitar. He hollers in true demo style fashion. Think Edison's Demos or We've Moved. This is a lonely, somber tune that's essentially off-the-cuff and stinking up the place. The Elevator To Far Worse- 3 Super lo-fi track with distracting, and unnecessary, delay on Pollard's vocals. A shame, really, being that this super short tune is a ramshackle, bubble gum GBV EP type tune. If you can get past the silly reverb howling, this tune is pretty solid. Reminiscent of something off Plantations Of Pale Pink. The Throat Is Young- 2 Let's get this out of the way. This title is gross. What the hell? Okay. Acoustic guitar, and nice use of clanging wind chimes for a brilliant unsettling feel. The song itself is another off-the-cuff outtake that is okay to miss. Just over a minute. I Would Be A Fish Tank- 2 Pollard gets sappy and whimsical on this one backed with flowing elfin guitar strumming and plucking. Gets rather falsetto at time. This is a demo outtake for the wizards and mystics in the room. Pretty cheesy.